Millions of people in Nigeria’s north-east were displaced due to Boko Haram violence, now in its seventh year. More than 1 million people moved within the most affected areas in Borno state, while others fled further afield seeking a better life and safety from conflict. The National Emergency Management Agency is now establishing camps to help provide that safety due to the conflict in nigeria north east. Mohammed Yatua sits outside his shelter in Malkoi camp for displaced people, located on the outskirts of Yola conflict in nigeria north east. More than 1,500 people have set up home in the camp because of conflict in nigeria north east, which is managed by the National Emergency Management Agency (NEMA) and was once the grounds of a school. 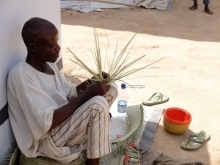 Mohammed is making a mat from grass he collected around the camp. It takes him two weeks to weave, and he receives ₦1,000 (US$3). “We’re here two months now, and there is a demand for mats, so I sell them to others in the camp,” he said. Like thousands of others, Mohammed, his family and friends were driven from their home in Gwoza when the violence became too intense. When Boko Haram attacked remote villages, homes were razed and infrastructure, crops and animals were destroyed. Those left behind either had to join the rebels or were killed. Those lucky enough to escape left their homes with just the clothes on their back due to effect of conflict in nigeria north east. Mohammed Yatua, originally from Gwoza, Borno state, is one of the millions of people who fled Boko Haram violence. He now makes mats and sells them in the market for the equivalent of US$3.